Most people know that the ancient Greeks invented democracy (demos – ‘the people’ and kratia – ‘power’). But we Brits like to imagine it was us – Westminster is “the mother of parliaments”, and all that. In fact, Iceland’s Althing and Sweden’s Jamtamot date back to the 10th century, both much older than the Westminster Parliament, and the Isle of Man’s Tynwald also claims a 1,000-year history – though less convincingly. Possibly, the UK’s Parliament has had better publicity. In any event, parliamentary democracy, for all its shortcomings, has had a profound impact on the making of Britain: how did it start? You’d think that medieval kings could do pretty much as they liked. It certainly wasn’t a good idea to upset one. But it stands to reason that all monarchs need sufficient cash and support in order to wield power. Saxon kings had ruled largely through the Witenagemot, an assembly or counsel of nobles. Post Norman Conquest Kings called ‘Great Councils’ (the forerunner of parliaments – from the old French parlement – ‘speaking’), but they had to deal with the realities of feudalism. From the King of England’s point of view, one of the flaws of feudalism was that it depended entirely on the support of very powerful subjects indeed (like barons and bishops), many of whom had significant economic and military assets. Therefore a good chunk of British history chronicles the inevitable struggle between monarchs who wanted to do things that their rich and influential friends and associates did not want them to. So, let’s mention King John. History paints John, who ruled 1199-1216, as a rather unlikable figure, definitely not as cuddly as other monarchs. He certainly hacked off the Pope – which could be awkward in those days. Legend has it that Robin Hood didn’t like him much either. His unpleasantness included playing fast and loose with other men’s daughters and wives. But a more lasting legacy was the fact that he very carelessly managed to lose most of the family lands in France. His father, Henry II, had been one of the most powerful rulers in Europe, governing territories that included Normandy, Maine, Brittany, Anjou, Touraine, Aquitaine, Gascony and Toulouse – known as the ‘Angevin Empire’. Under John, all of these lands were lost to the King of France with the exception of part of Aquitaine and Gascony. John’s attempts to raise more and more taxes to fund unsuccessful military campaigns to recover these lost assets proved to be the last straw. In 1215 the leading nobles forced John to sign the Magna Carta, or ‘Great Charter’, at Runneymede. 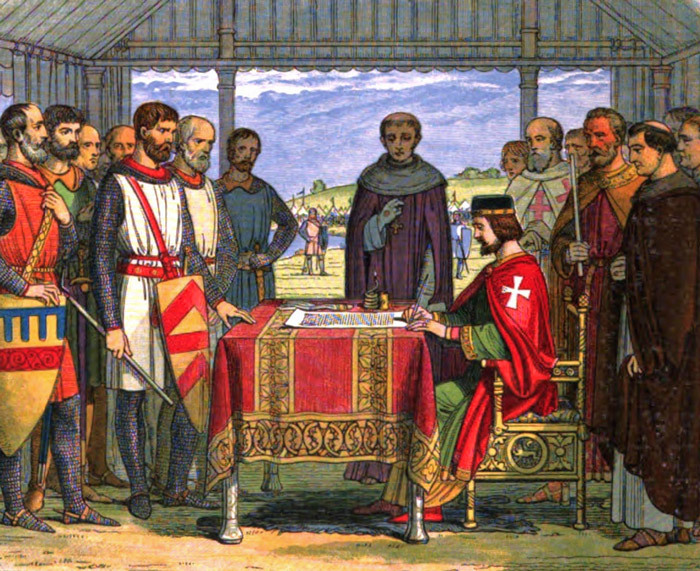 Magna Carta shouldn’t be seen as some sort of Bill of Rights, as some people suggest – and it was largely ignored anyway – but it is enormously symbolic, and significant in stating that the monarch is not above the law; Magna Carta laid the foundation for future governance. John’s son, Henry III (ruled 1216-72), was clearly a chip off the old block. Some of the great and the good felt they were being ignored, they didn’t like some of Henry’s friends and he supported an invasion of Sicily without telling them. So the barons forced Henry to form a council and call more regular parlements. Eventually, war broke out between the King’s supporters on the one hand and a rebel faction on the other, under Simon de Montfort, Earl of Leicester. The King was defeated and captured at the Battle of Lewes in 1264 and de Montfort called a parliament which for the first time included representatives from each shire and borough. Simon de Montfort’s parliament of January 1265 is seen by many as a precursor to the House of Commons, and unquestionably future English monarchs would be forced to deal with Parliament; but de Montfort almost certainly never envisaged a parliamentary democracy as we all aspire to today. Henry’s son Edward I, who ruled from 1272-1307, was a more wily authoritarian than his father. He also had an agenda to unite Britain under his rule. So he used parliament often, primarily to raise money for his wars against the French, Scots and Welsh. And it is really from the reign of Edward that the English Parliament began to be an integral, but initially irregular, part of English governance, particularly after the so-called ‘Model Parliament’ of 1295. This included representatives of the lower clergy for the first time, as well as two knights from each county and two burgesses (officials) from each city, town or borough. Thus was set the format, or ‘model’ for most future parliaments which consisted of three institutions – the Commons, the Lords and the Monarch. Whilst the Monarch sought to obtain Parliament’s approval for money-raising taxes, it then became normal for Parliament to seek something in return, a quid pro quo. This eventually resulted in Parliament presenting and debating petitions, or ‘bills’, requiring the monarch’s assent – and therefore developing Parliament’s legislative authority. The medieval Parliament met in the old Palace of Westminster, which burned down in a fire in 1834, or in the Chapter House or Refectory of Westminster Abbey. From 1547, they had the use of the Palace’s chapel. Under Henry VIII, Parliament underwent a fundamental change. Henry’s break with Rome in the 16th century transferred all religious authority to the Crown and, under Henry’s direction, Parliament found its breadth of interests and power dramatically increased – no aspect of government was beyond its legislative remit. Thus Parliament took on religious, social and economic matters. Though Parliament still existed only by the monarch’s will, it is inevitable that the relationship between an absolutist monarch and a parliament will be an uneasy one. In order to get his/her way, the monarch has to be able to control parliament. Parliament, on the other hand, might feel they should control the purse strings and limit the monarch’s power. In the 17th century, under King Charles I, the relationship irretrievably broke down and Parliament became a revolutionary body.